Jvari is a masterpiece of the early Medieval Period. It stands on a mountain opposite the ancient city of Mtskheta. St. Nino erected the first wooden cross at the site. Its pedestal can still be seen in the centre of the church. This example of classic tetra conch design with all its miniature size, strikes the viewers with its grandeur and integrity. The interior, once decorated with mosaics is rather bare today, but a spectacular view opens from the church, which is seen from far away, equally well from all directions. Svetitskhoveli - which may be translated as "The Life-giving pillar", is the main church of Mtskheta and a sacred place where the robe of Christ is being kept. An enormous cedar tree grew on a place where Christ's robe was buried. The place was chosen as a site for the future church. The branches of This magic tree served for constructed pillars. This bright example of Georgian renaissance architecture was erected by architect Arsukidze in 11th c, in the place where the first church in Georgia once stood in the 4th c.
Bagrati church of the Assumption of the Virgin was built by King Bagrat III in Kutaisi, in 1003 AD. It is a marvellous example of domed-church architecture from the high Medieval period, noted with impressive examples of stone carving. Partially ruined cathedral is situated on the top of the hill called Ukimerioni and commands a splendid view of Georgia's second city, Kutaisi. This was an ancient citadel, a royal palace and one of the most important castles from 6th to 17th c.
Gelati complex comprises the churches of the Virgin (the main church), of St Nicolas, of St. George, as well as the academy which was the centre of cultural and spiritual life. 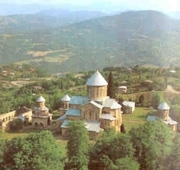 The Gelaty monastery complex was founded by King David the Builder in the 12th c. It is noted by the finest examples of Georgian mural painting. Among them is the only surviving portrait of King David the Builder whose grave can be found at the gateway of the monastery. The giant 12th century mosaic of the Virgin with Child is completely unique.